Welcome to our site! If you've been looking for a true wholesale source for a wide variety of merchandise, you've found it! We've been selling on the internet for well over 8 years. We're now providing the same fine merchandise to you at true wholesale prices. Whether you're stocking your website, selling on online auctions, or searching for a new source for merchandise for your brick-and-mortar store -- or just love great deals! -- you'll find a wide range of top quality merchandise here at wholesale and below-wholesale prices. Click Here for our Atomic Mall storefrontClick Here for our eBid AuctionsClick Here for our Epier Auctions!Click Here for our Webidz Auctions! Each week we offer some extraordinary specials. Supplies are limited, so grab them now while they last at these unbeatable prices! All prices include shipping via UPS ground. Please note that we can ship only within the continental United States. 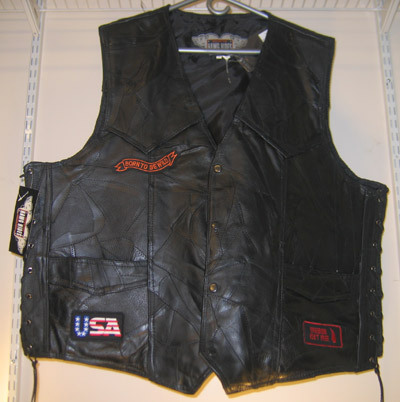 Leather Biker Motorcycle Vest. Multiple patches, black snaps and laced sides. Patches include: Born To Be Wild, Freedom Isn't Free, and USA on the font vest. 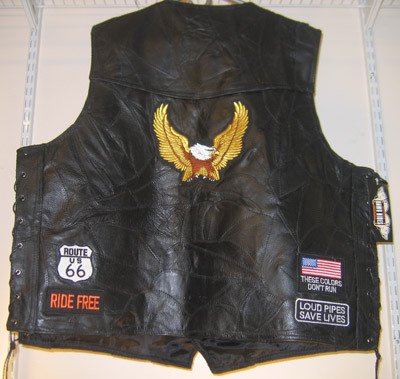 and Rt 66, Ride Free and a large eagle patch on the back. Get a wholesale lot of 10 of these vests. Save money when you buy in bulk! Lot will contain: 1 medium, 2 large, 2 extra large, 2 2X, 2 3X, 1 4X. Blow-out priced! Limited time offer...get yours now! Anyone who ever said that marketing on the internet was easy, has never marketed on the internet! Anyone who wants to succeed must work at it, just like any job! Especially with fluctuations in the economy, people are becoming more and more concerned about their jobs being jeopardized by recession. I've been working online for almost 10 years, and in that time I've come upon a lot of "get rich quick" schemes that don't do anything but make the person you're paying rich! We all read stories about people who have struck it rich online...but how in the world did they do it? Recently I came upon a program designed by three of those internet superstars. For the first time, they're sharing their knowledge with others. Why are they doing this? They know that people are worried. The fear of recession is everywhere...at every level of our economy. If you, like me, have more bills than money and wonder from week to week how you'll make ends meet in this economic crunch...how you'll pay the mortgage, the car payments, the oil prices...and eat, too!...then you need to take a look at this! To learn about this brand new "Recession Rescue System", Click Here! Everything needed for the Kitchen Cutlery in a block. 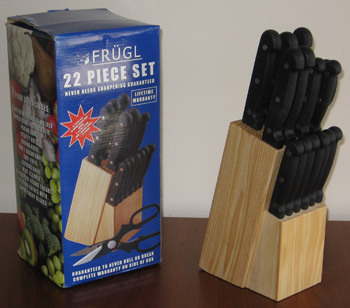 Contains: 12 Steak knives, Cleaver, Chef knife, Bread knife, Boning knife, Utility Knife, Paring Knife, Tomato knife, Shears and Custom Made Wood Block. Limited Lifetime Warranty. Get a wholesale lot of 10 of these sets at an even lower price! Click Here for more information and to order this product. We've only just begun! We have literally hundreds of products that we'll be adding to our site just as quickly as we can get them posted! So please check back frequently. And be sure to fill out the form and the top of the page to be notified of our newest special deals! Click on any of the links below to see more of our products.